Bring the fun outside with the MyT Outdoor + In waterproof ping pong table series. Made of aluminum-plastic that is 100% weather resistant. Designed to avoid warping for a consistently smooth playing surface. Revolutionary storage pockets are built right into the table frame. Pockets for ping pong balls and rackets are in each end of the table to allow easy access to table tennis equipment. Ball pocket holds up to 8 balls while racket pockets hold up to 1 racket each. Made of powder coated steel with folding capability designed to allow for solo play. The sturdy folding frame features an automatic gravity locker and wheels for easy moving. Wheels also have brakes to keep table locked in position during play. Table feet are adjustable for a perfectly level playing surface. You will applaud the quality a and attention to detail. Bring the fun outside with Killerspin’s MyT Outdoor + In line of folding ping pong tables. Each of our outdoor tables is built to withstand the elements and is completely weatherproof. They’re at home outside; from the backyard, to the patio, in the garage, even at the beach. Water, wind, rain, sun or cold – these tough tables can endure all weather and levels of humidity. Even a spilled beer won't harm them. Your gatherings, BBQs, birthday parties, and family gatherings will never be the same once you get a MyT Outdoor ping pong table. Be ready to become the most popular house on the block this summer! 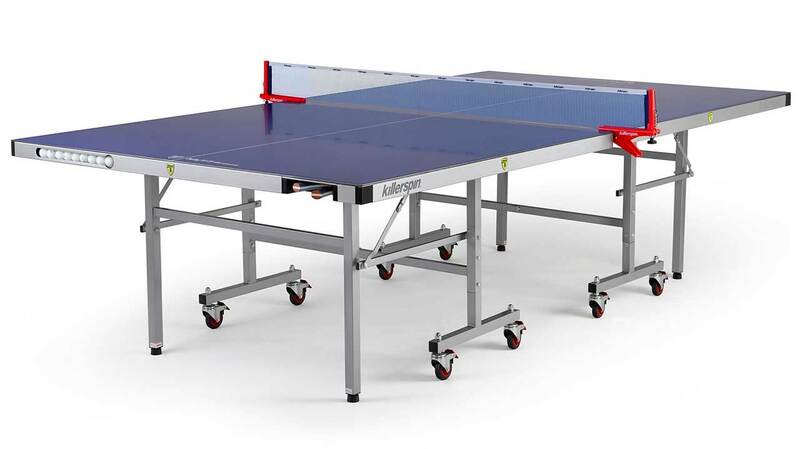 Rather than a wooden table top as you’ll find on most other table tennis tables, our MyT Outdoor + In line features a special aluminum-plastic top that is completely waterproof and fade resistant. Rain or shine, you can play ping pong outside in confidence with our versatile, regulation size outdoor tables. Their thick and durable powder coated steel frame resists corrosion, while their oversized wheels make rolling the table out into the backyard’s grass or the beach’s sand an easy task. There’s no reason to keep the game inside when you have a MyT Outdoor + In table from Killerspin. Each new all-weather MyT Outdoor table now includes two handy storage pockets on each of the player's sides. These pockets hold up to eight balls and two paddles for each player, reducing the amount of time spent chasing after loose balls and preventing damage to precious paddles during storage. When you’re not playing, these tables easily fold for storage and conveniently roll out of the way. Their compact footprint of 60in x 64in x 24in when folded means you can slip them into the shed or a corner of the garage without sacrificing precious storage space, while their weatherproof construction means they’ll happily overwinter in cold and damp areas such as the garage or tool shed. They do all this while still maintaining the regulation size of 274 cm. (9 ft.) in length, 152.5 cm. (5 ft.) in width and 76 cm. (2 ft. 6 in.) off the floor. Add in the MyT Jacket ping pong table cover and you have an amazingly durable combo. That is, unless you want to roll them inside for cold weather fun and exercise! 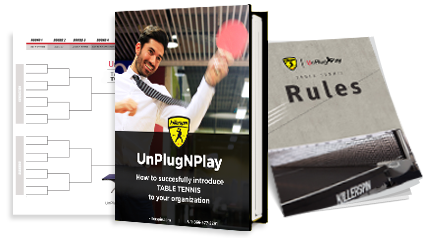 We didn’t just add the “+ In” part for fun, these ping pong tables play well enough that you don’t need an indoor table for serious play and an outdoor table for fun in the sun, the MyT Outdoor + In line handles both tasks equally well. Ball bounce is so consistent and true that your only opponent will be that backspin serve that gets you every time!